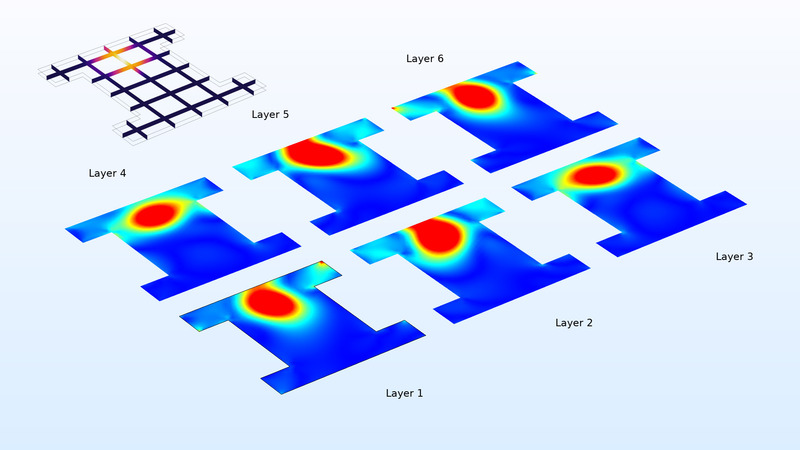 COMSOL Multiphysics® version 5.4 introduces the new Composite Materials Module. This add-on to the Structural Mechanics Module allows you to model laminates and layered materials, with new Layered Material technology. There are two different formulations for layered shells: one that is based on a classical laminate theory and another that is based on a more complete 3D theory. The former is implemented in a material model in the existing Shell interface, whereas the latter forms the basis for the new Layered Shell interface. The user interface includes tools for specifying isotropic and anisotropic material properties in layered materials together with dedicated visualization tools used to display the layers graphically. 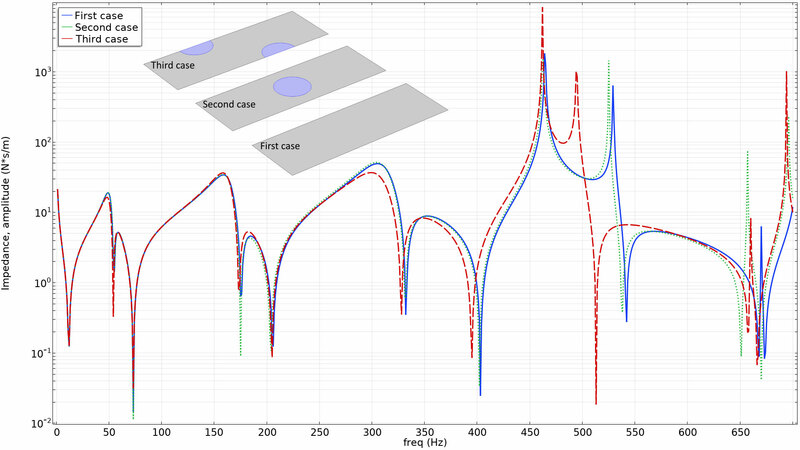 This module is useful for structural analysis of composite laminates, and can be coupled to the Heat Transfer Module and the AC/DC Module for multiphysics analysis of composite materials. By combining the Composite Materials Module with the Heat Transfer Module, you get more sophisticated heat transfer and thermal expansion functionality. Similarly, you can combine the Composite Materials Module with the AC/DC Module for layered materials functionality within the Electrostatics and Electric Currents interfaces. Using the new Layered Material node, it is possible to define a layup where each layer has its own material data, thickness, and principal orientation. Layered materials defined in this way can be combined to create new layered materials. This is particularly convenient when the layup is repetitive or when modeling ply drop-off. It is also possible to define material properties for the interfaces between layers. Preview plots in 3D and 2D are available for visualizing the input data. 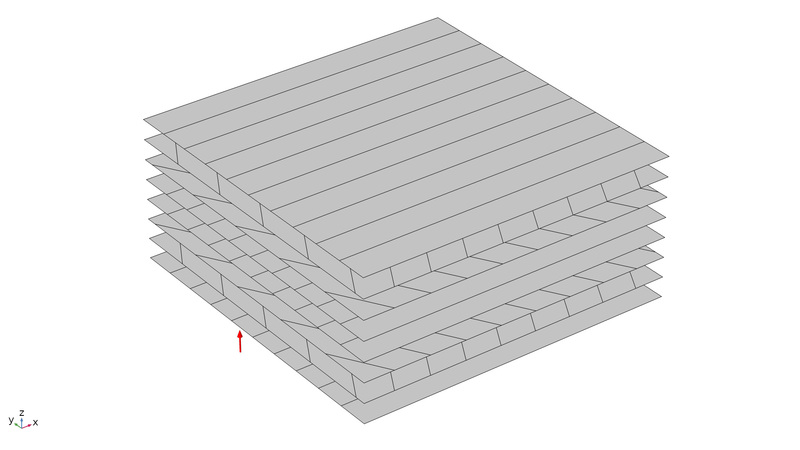 Defining the layup of a layered material (inset) and a preview plot showing principal orientations of each layer. 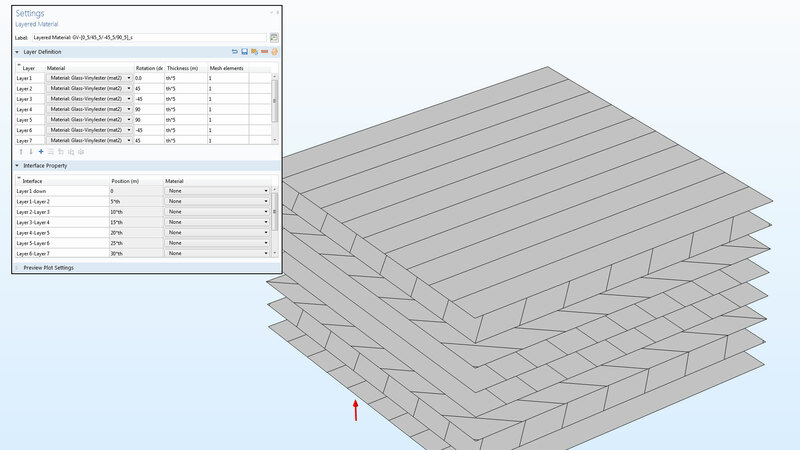 Defining the layup of a layered material (inset) and a preview plot showing principal orientations of each layer. The Layered Shell interface is used for detailed analysis of a laminate, with results including full 3D stress and strain distribution. You can, for example, compute interlaminar stresses and study stress variations inside each lamina. Boundary conditions can be placed on individual layers, and even on individual interfaces between layers. The materials in the individual layers can be nonlinear. The formulation of this physics interface makes it suitable for thick and moderately thin shells with a limited number of layers. Each layer can have a different number of elements through the thickness. Transverse shear stresses in a three-layer laminate; comparison between the Layered Shell interface and exact 3D solution. 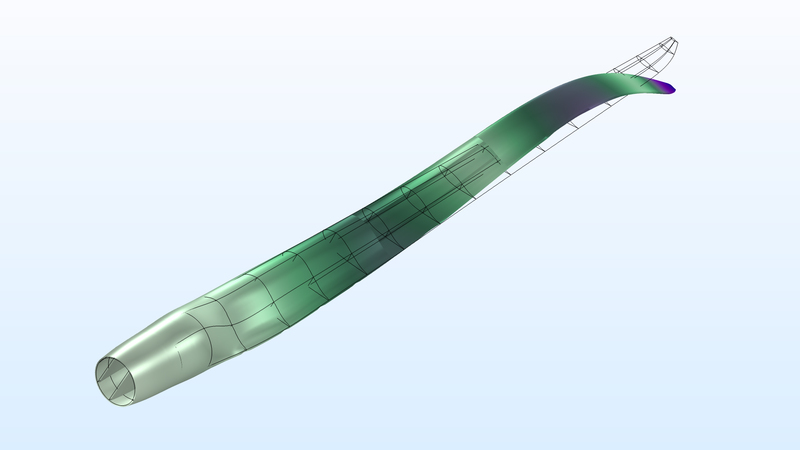 With the Composite Materials Module, the previously available Shell interface is augmented with a new material model: Layered Linear Elastic Material. This material model, which is suitable for thin and moderately thick shells, can accommodate many layers without significant performance impact. It is based on an equivalent single layer approach, where all layers are aggregated into an equivalent material. The third eigenmode of a wind turbine blade designed as a sandwich structure. The third eigenmode of a wind turbine blade designed as a sandwich structure. When evaluating results in layered structures, some extra tools are needed. 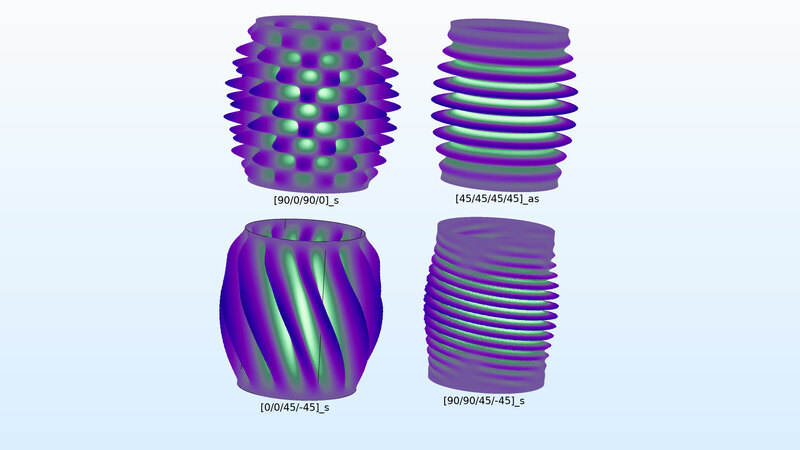 A special Layered Material dataset makes it possible to display results from layered shells using a full 3D solid representation. It is also possible to create slice plots of several types. For graphing, there are special tools for visualizing the variation in the through thickness direction. Different types of visualization of a thick three-layer laminate. Different types of visualization of a thick three-layer laminate. All physics interfaces for layered materials share the same representation of the layup of a laminate. 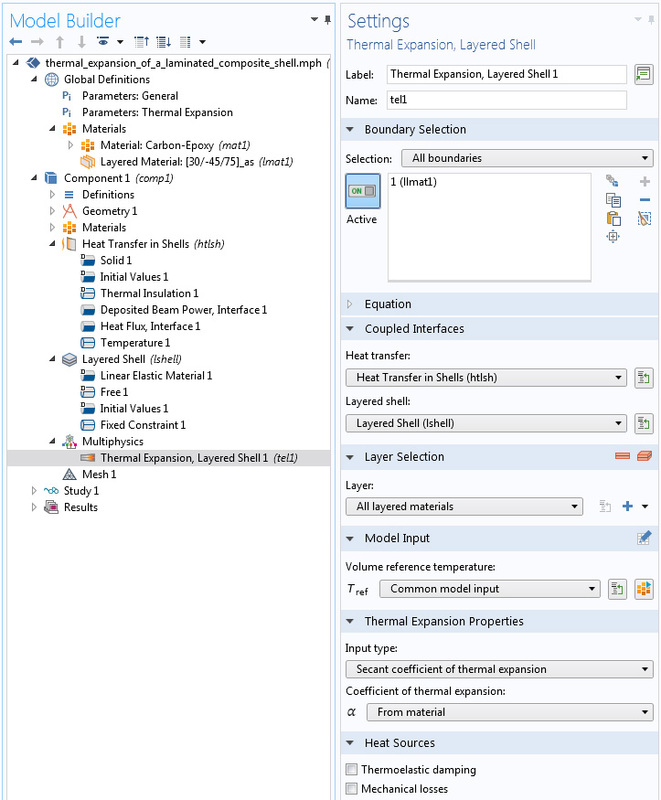 This means that it is easy to set up models describing multiphysics within the layers of the structure. 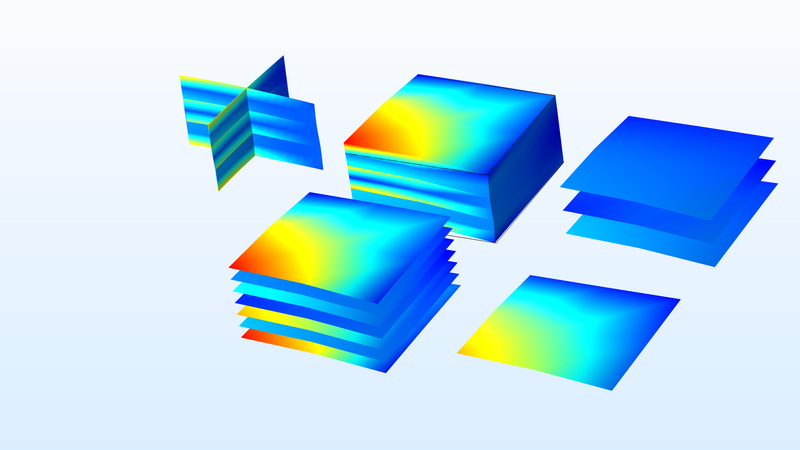 For the common case of thermal expansion, a predefined multiphysics coupling between the Heat Transfer in Shells interface and the Layered Shell interface is available. Other multiphysics options include the thermoelectric effect, when combined with the Heat Transfer Module, and Joule heating, when combined with both the Heat Transfer Module and the AC/DC Module. 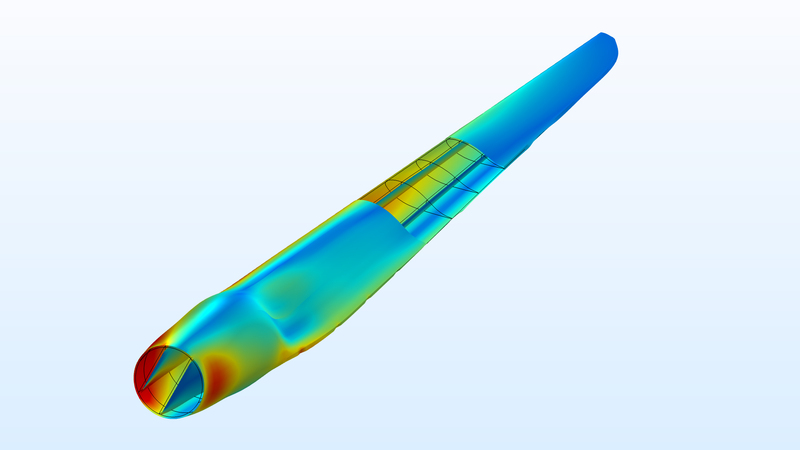 Fluid-structure interactions involving composite materials can be modeled by combining the Shell interface for layered linear elastic materials with one of the many interfaces for fluid flow. 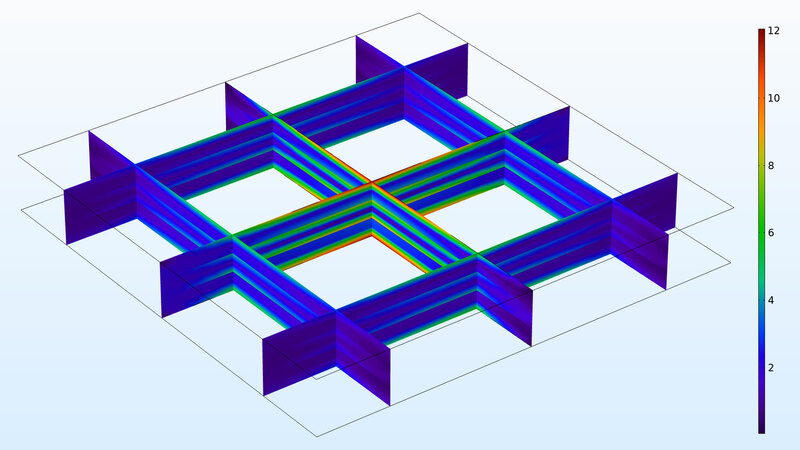 By combining the Composite Materials Module with the Acoustics Module, a dedicated multiphysics coupling enables acoustic-structure interaction with layered linear elastic materials. You can see the implementation of multiphysics, with thermal expansion, in the Thermal Expansion of a Laminated Composite Shell model. 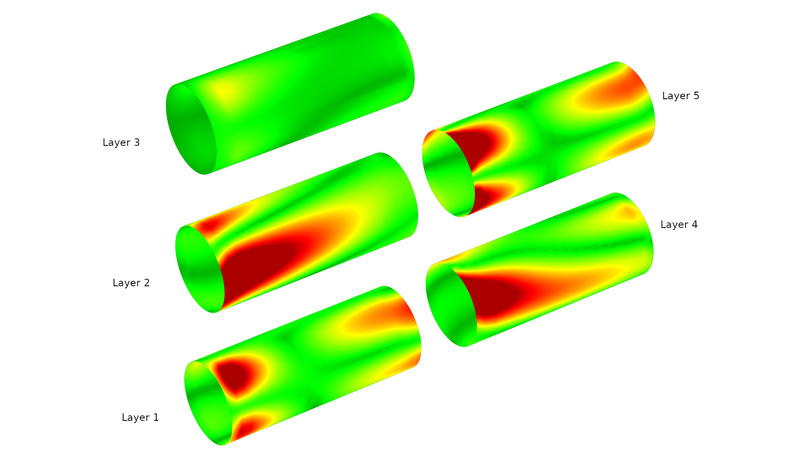 COMSOL Multiphysics® version 5.4 includes several new tutorial models. Orientations in a [0/60/-60/0/0/-60/60/0] laminate. In this example, the equivalent elastic properties for a homogeneous shell are computed and compared with reference values. Stress in a simply supported three-layer plate subjected to bending. Buckling modes for the same shell with different choice of fiber orientations in the lamina. Impedance of a layered plate with and without debonded regions. 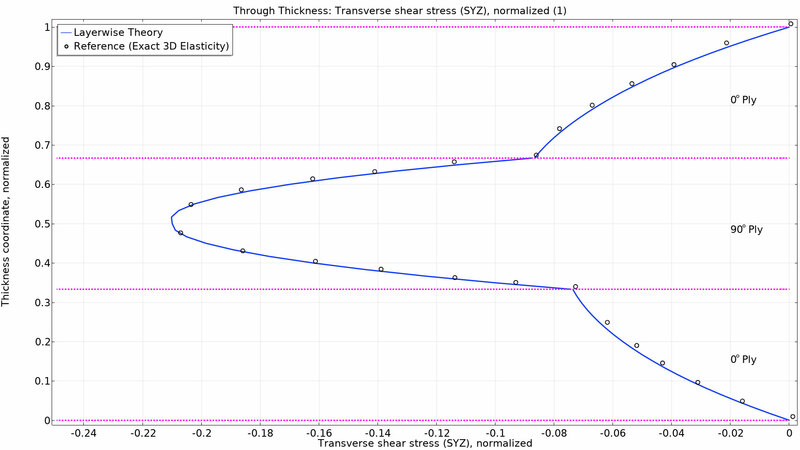 Stresses in a wind turbine blade. The skin has 19 layers and the core is a thick PVC foam surrounded by several layers of glass fiber composite on each side combined with an external carbon fiber cladding. Effective stress caused by heating in a six-layer composite. 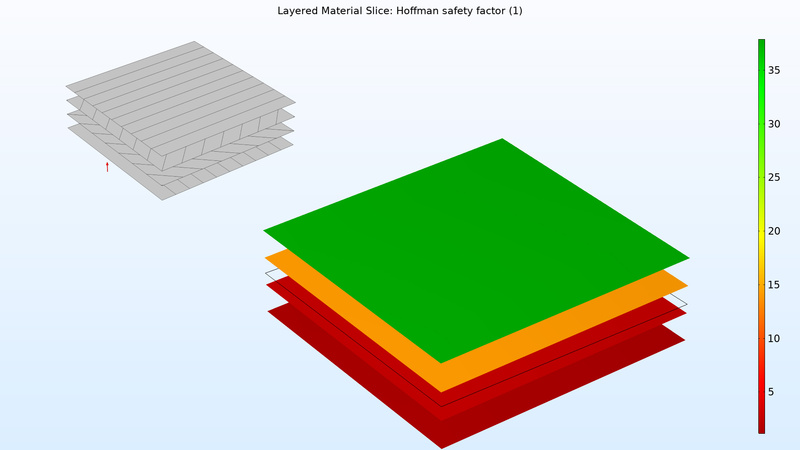 Safety factors according to the Hoffman criterion for a uniaxially loaded laminate. The principal orientations of the lamina are shown in the inset. Stresses in all layers of a tube designed as a five-layer composite laminate.